As My daughter says, “The sprinkles put the Fun in Funfetti.” What do you get when take a Funfetti Cake Mix (white cake with a bunch of sprinkles) and add even more sprinkles? More fun. 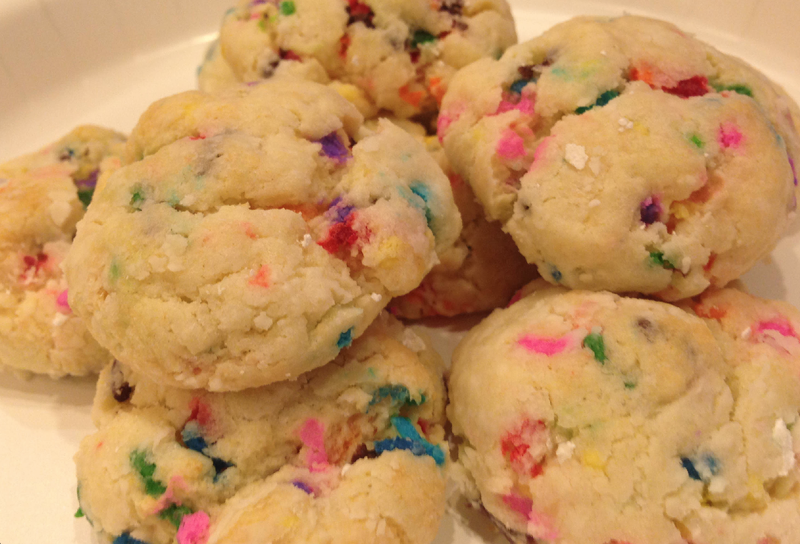 Now, add some cream cheese and you have a fun, decadent cookie. In bowl beat cream cheese and butter together until smooth, add in egg and continue mixing, scraping sides as necessary. Add in the cake mix and beat until combined and finally stir in extra sprinkles. Chill dough for about an hour. Form dough into 1 inch balls and roll in powdered sugar. Place on baking sheet 2″ apart and bake for about 10 minutes. Allow to cool on baking sheet for 2-3 minutes and then transfer to wore rack to cool completely. These look like a fun summer cookie to make with the kiddos! Thanks!